Another visit to Cotters Market, another variety of bananas – but purely by coincidence this time. One of my readers got in touch a couple of months ago, responding to my offer of Ducasse suckers and offering some of his own Blue Java in return. In the end he decided that he already had Ducasse but last weekend we met anyway and I came home with a few of his Blue Java bananas, just picked, and a good-sized sucker – thanks, Carl! 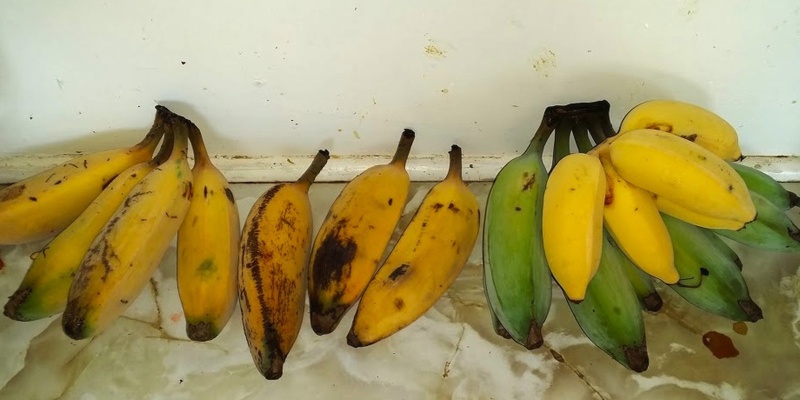 The Monkey bananas, Red Dacca and ripe Ducasse (aka Sugar bananas) came from Cotters Market on the same morning and I seized the opportunity to show the sizes of each variety in relation to the others. Lady Finger are almost exactly the same size as Ducasse. Blue Java are not very blue and they have no obvious link with Java but there are no problems with their identity in that there is only one common name for them and it isn’t used for other varieties; Wikipedia covers all the basic facts very well. 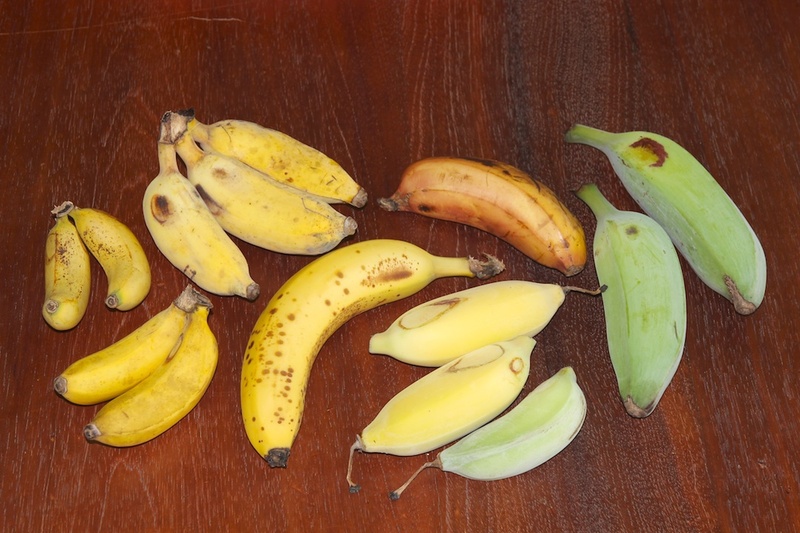 The “blue” in their name is due to the fact that foliage and unripe fruit have a blue-green-grey tinge, especially as compared to the bright grass-green of most bananas. The skin is thick and the fruit inside is soft and creamy when ripe, with white flesh and (unusually) seeds which are large enough to notice. The flavour has been compared to vanilla ice-cream and to pineapple. Carl says he likes Blue Java best at the turning-black stage in the middle of his photo but I preferred them at the just-fully-ripe stage at the left of the photo. They make another nice addition to my growing list of varieties and I look forward to having a bunch of my own sometime next year, scrub turkeys and weather permitting. It lists 20 varieties with photos and one-page descriptions.